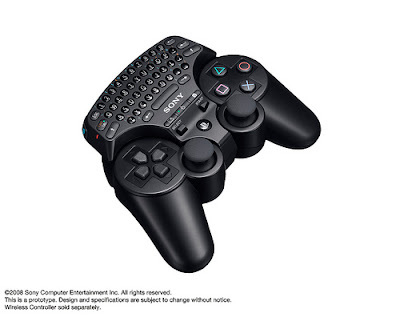 Sony recently announced that they would be releasing a wireless keypad accessory that snaps onto the PS3 controller. Some unique features of this wireless keypad includes a mode that turns the keypad into a touch pad - like on a laptop - that allows you to run your finger over the keypad to move the cursor on the screen and tap it to enter. There are also a couple of shortcut buttons that will allow you to access the XMB Friends and Message Box sections. When attached to the PS3 controller, the wireless keypad can be simultaneously charged when connecting the controller to the PS3 via USB cable. In addition, the wireless keypad is Bluetooth enabled and can be used with other Bluetooth devices that support a keypad functionality (such as smartphones). The wireless keypad is set to launch in late November.